If you were inclined to fill in the blanks with “wine,” don’t feel bad. These are clichés that will take some time to be struck from our vocabulary. The more people discover beer’s affinity with food, the less people will subconsciously utter the phrases. This has already happened with tea and especially coffee. How many cafés can you walk into and order “a coffee” without getting any further questions from the staff to determine what exactly it is that you want. Similarly, there are fewer and fewer places where you can order “a beer” and expect to leave it at that. On May 20th, Two Chefs and a Table are contributing to the evolution of our culinary lexicon by hosting a six-course dinner with both beer and wine pairings for each dish. 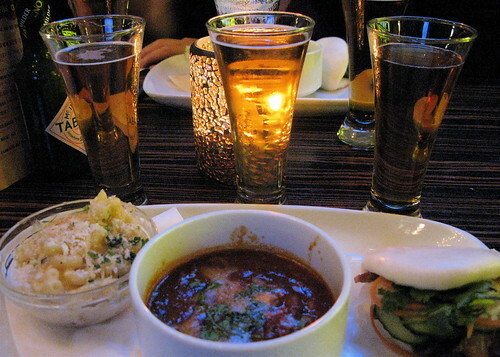 Diners can choose for each course whether they want beer, wine, or both. Paul Watkin of the Seacove Group worked with executive chefs Karl Gregg and Allan Bosomworth to build the menu for this unique event. The cost for the Wine and Beer Drinker Dinner is $65 per person (not including tax and gratuity) with the option of having both beer and wine with each course for $80; reservations are recommended. Call (778) 233-1303 to book a spot. Needless to say, I’m delighted Two Chefs and a Table are taking this approach. It’s rather silly to be pro-beer and anti-wine or vice versa. Allow the two to stand side-by-side and give people the opportunity to discover which they prefer. It could be one, it may be the other, perhaps both but for different reasons. There’s only one way to find out. When it comes to beer, most Asian restaurants typically offer little but lager because that is the dominant, if not only, style of beer brewed in their respective countries. For the lager loather, they may have Guinness, but that doesn’t mean it actually pairs well with any items on their menu. 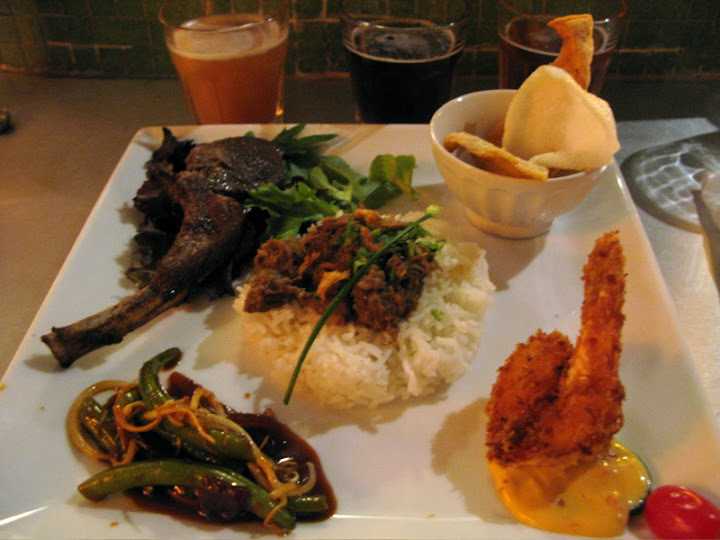 This is a shame because there are a number of beer styles that go very well with different Asian dishes. For example, every Indian restaurant should have an India Pale Ale (Alexander Keith’s not being an IPA), not only because the style was created for India but because it also happens to go well with many spicy Indian dishes. Salads pair well with wheat beers. In this case, I chose a Belgian wit to go with the Gado Gado. Wheat beers also pair well with seafood. But to change things up a bit and showcase another style of beer, I chose to match the prawn with a saison, a very versatile and palate-cleansing food beer. Darker beers typically pair well with dark meats. The trick is to discover which style. Depending on how it is prepared, lamb can have a strong flavour. In this case, the spices it is marinated in cut down on the gaminess, while grilling brings out some sweetness from caramelization. Therefore, I chose a brown ale that complements this, but won’t overwhelm the taste of the food with heavy body and full flavour. One might be tempted to pair the beef rendang with a porter or stout. However, this one was spicy. If you aren’t able to handle a lot of chili heat, either of these styles will be completely inadequate to stand up to the spiciness. Therefore, I chose an India pale ale to dampen the heat. If you can find one, even better would be an India brown ale. The hop bitterness would counteract the chilis on the one hand, while the malt sweetness would be a better match for the beef. How much spiciness you can handle in your food actually makes a difference as to what style of beer will pair best with your food. The less heat you can handle, the bigger a beer you need; the converse is also true. Finally, the deep-fried banana has some options, depending on how it is presented. If there is any chocolate sauce, a chocolate or roasty imperial stout would work. In this case, however, it was plated with a scoop of vanilla ice cream and fruit. Consequently, I chose a wheat Eisbock because the caramel of the beer goes well with the carmelized batter of the banana. Also, the banana esters from the wheat beer yeast complement the dessert perfectly. The owners of Saté Satu were very pleased with the outcome of the dinners, not only because their customers were satisfied with the experience but it gives them an opportunity to distinguish themselves from their competitors. Consequently, they modified their beer selection to include the ones above. My next beer pairing dinner will be on November 19 at the House of Dosas (1391 Kingsway, Vancouver) with dishes from Sri Lanka and Tamil Nadu.